(UPDATE 8/18/16) Conor McGregor and Nate Diaz were at it again on Wednesday afternoon, as the two fighters hurled everything from insults to water bottles at each other at the UFC 202 pre-fight press conference in Las Vegas. Saturday night's highly anticipated bout, which comes just five months after their first meeting at UFC 196, is expected to be one of the premier fights of the summer. 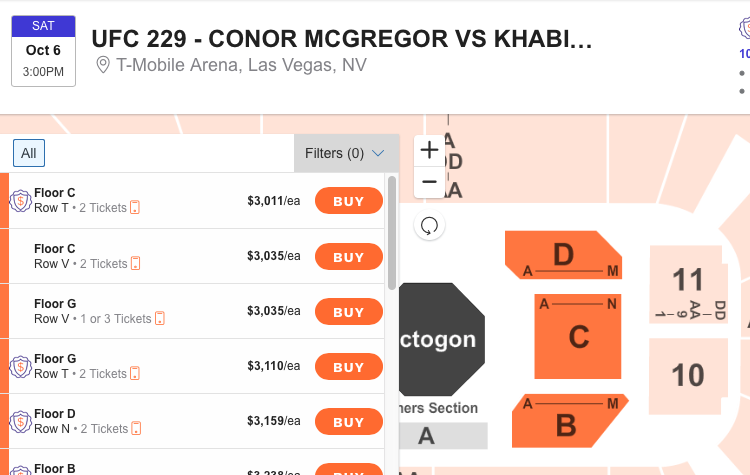 However, prices for UFC 202 tickets on the secondary market are steadily falling in the days leading up to the welterweight match at T-Mobile Arena. On TicketIQ, UFC 202 tickets now own an average price of $575.39, marking a 44% drop from the event's $1,028 average on August 10. The cheapest ticket can be found from $224 in Section 215. That is 33% cheaper than the $335 get-in price last Wednesday. McGregor showed up to Wednesday's press conference a half hour late, which gave Diaz and co-headliners Glover Teixeira and Anthony Johnson the spotlight for the majority of the event. McGregor's tardy appearance cause Diaz to walk out on the festivities, to which the two engaged in a war of words before McGregor began tossing full bottles of water and Monster Energy through crowd of media in Diaz's direction. UFC president Dana White was quick to stop the aerial assault and appeared agitated by McGregor's actions. The two square off in a rematch from their March 5 bout at MGM Grand Garden Arena. A late addition after Rafael dos Anjos was forced to pull out with a broken foot, Diaz upset the Featherweight Champion by way of second-round submission. Saturday's card will be the second UFC event held at T-Mobile Arena since opening its doors in March. While Johnson and Teixeira square off in the co-headliner, three welterweight fights will also take place on the main card. Rick Story vs. Donald Cerrone, Hyun Gyu Lim vs. Mike Perry and Tim Means vs. Sabah Homasi are all set to precede Diaz vs. McGregor II. (ORIGINALLY PUBLISHED 8/10/16) Get ready to break the bank if hoping to see Conor McGregor take another crack at Nate Diaz at UFC 202 at T-Mobile Arena next weekend. For those with interest in attending the long-awaited rematch, UFC 202 tickets in Las Vegas are posting huge price points on the secondary market. On TicketIQ, the average price for UFC 202: Diaz vs. McGregor II tickets is now $1,028.29. That makes it the fourth most expensive UFC event TicketIQ has tracked since 2010, when the company began recording resale ticket data. If looking just to get into the arena, the cheapest tickets are currently listed from $335 each in Section 104. Where does next weekend's Sin City rematch rank historically? Looking at the above graphic, only three other UFC events have posted higher ticket prices over the last six years. UFC 175, 200 and 137 still serve as the top three highest-priced events, though next Saturday follows closely behind in terms of average ticket price. The two fighters first met in UFC 196 at MGM Grand Garden Arena back in March. The match lasted just two rounds after McGregor lost by way of submission. It served as just the third loss of his MMA career and first since 2010, when he was defeated by Joseph Duffy at Cage Warriors 39 in Cork, Ireland. It was Diaz's 19th win of his career. Neither fighter has stepped into the octagon since their bout five months ago.